5starRocket gives you the ability to send a quick survey which is a survey sent to a single email address. This is a useful feature when you want to test changes in your email templates or just want to send a quick request. Hit the “Request Feedback” button (visible from all 3 tabs) then hit “Quick survey”. You will then be greeted by the “Request Feedback” window. Simply fill out your customer’s information. You will notice the “Don’t track this feedback survey” checkbox. 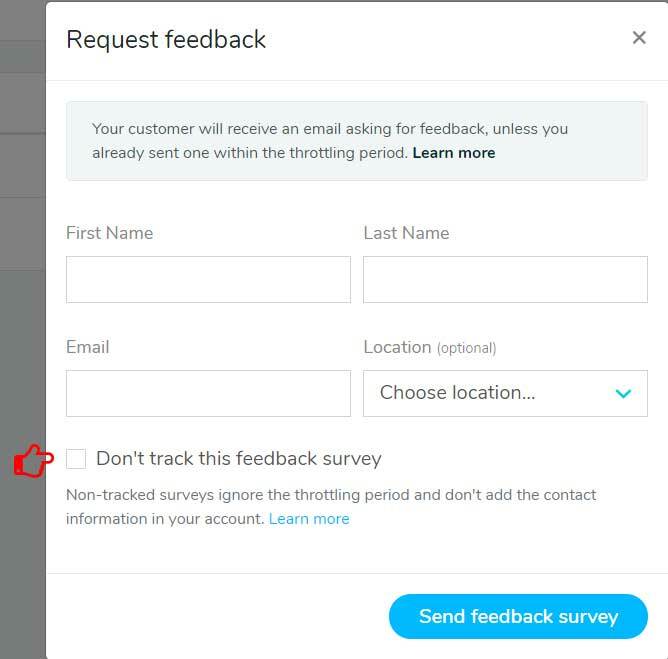 Checking this option allows the survey to be Non-Tracked. Non-tracked surveys ignore the throttling period (Survey throttling) and don’t add the contact information in your account. Once the survey is sent, your contact will be added to the Contact tab. Keep in mind that if that person decides to share their feedback, we will send a reminder asking them to share on review platforms (if you have that setting activated).